I used to love reading comics as a kid. Once I had gotten a little older, and the art form started being taken more seriously, I fell madly in love with comics as an artistic medium and spent a fair amount of my available cash at the time on some books I considered “collector’s pieces” aswell as some I just plain liked to look at and read. Skip ahead to the current “paperless society” we are all striving so hard towards. My beloved collection of colourful rarities is now in storage (half and half space concerns and toddler damage) and over and above those books which I did purchase way-back-when, there are a whole host of titles I would have loved to have read but never got the chance to due to import restrictions in my country at the time. Fortunately, thanks to the wonders of modern technology, I can relive my youth by browsing through all the old pages I loved so much and I can further augment the experience with stories and illustrations only dreamed of as a boy. “How is this possible!? !” you may be asking, well using the internets and my trusty eComic reader of course… ComicRack FTW! Got it? Installed it? Right… now you are empowered as never before to read your eComics with blissful ease. But, what if (like me) you are occasionally prone to fits of EXTREME laziness, and the thought of mustering enough energy to operate your mouse and keyboard and (shudder!) sit up straight for bit makes you want to have a little lie down, then you want to take the comfort factor a step further. What if you just want to veg out whilst lying prone on your couch, expending the least amount of effort required while you flick through some old comics, much as you may have when you were a youngster. My first solution to this quandary when I started using ComicRack was to grab my old Logitech MX1000 Laser mouse from my drawer full of backup hardwares. This worked a treat for scrolling through pages, but it’s always a pain in the ballsack to try operating any kind of optical tracking device on my couch/blankets, so I quickly tired of the concept and shelved reading comics for a while. 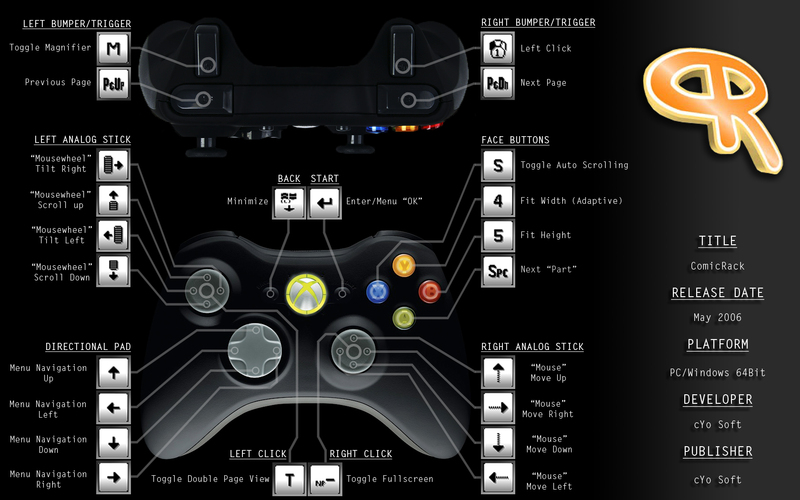 Enter Xpadder! A few weeks ago, as many of you will know, I started fiddling with using Xpadder as bridging software between my old DOS games and my 360 controller. So, I got to thinking (as you do) that maybe that could be the way forward for ComicRack also. Thusly, I started working on a control scheme for this awesome little app with wild abandon and joyful glee, and lo and behold, it is done. Bumpers turn your pages backward and forward, whilst left and right triggers operate the magnification tool and “left click” respectively. Everybody’s favourite green “A” button is used to advance your view forward to the next part of the page, but you can also use the left analog for up, down, left and right movement (scroll wheel/tilt emulation). Another alternative for moving your view around the page is to use the right trigger as a modifier along with the right analog (which emulates mouse movement) effectively allowing you more precise movement. The only drawback I found with this method of movement, is that the axis’ feel a touch unnatural as I would preferably have inverted both X and Y. Sadly, this is not an option as mouse movement is also needed for folder navigation (reversing up and down would surely lead to severe insanity) and ComicRack has no option to change these settings (at least, none I could find). On the topic of folder navigation, I have left the cursor key assignments intact to correspond directly to the D-Pad. This allows you to move the mouse to the pane you want to sort through, then click once with the right trigger, then switch to D-Pad for easier, error free folder selection. I configured the “start” button as the return or “enter” key to assist with this method of browsing as it can be used to immediately activate your selected option without the need to first manoeuvre the mouse pointer to where you need it. Of course, the companion button to “start” is “back”, and this button has been given the task of minimizing the application. I have configured my ComicRack to minimize to system tray, thus it is nice to have the option to quickly minimize my comics so that I can focus on other things. The last few assignments are the double page toggle mapped to the left analog click, the option to go full-screen with the right analog click, the ability to zoom out to fit height with the “B” button and to zoom back in with the “Y” button to fit width (adaptive) for more focused reading. Lastly, the “X” button is used to control the “auto scroll” feature, useful and pretty, but sometimes it is just a few pixels off and prevents you from viewing text without scrolling backward and forwards. This can either be toggled off when needs be for a more controlled nudge on the left analog stick (my preferred method) or overcome with the aforementioned combination of right trigger/analog stick to emulate “click and drag” functionality. Here is a visual representation of my layout. And some screenshots of ComicRack running on my system showcasing a variety of viewing modes which you can switch to on the fly with my configuration. One anomaly I would like you to be aware of, is that it is stated in the above resources that the default key binding for “full-screen toggle” is “F”, I found that the version of ComicRack I am using (V 0.9.101 64Bit) defaults that particular mapping to the “subtract” or “-” key on the numeric keypad. This may need to be tweaked if you are using an older version of the reader, as I have configured it to correspond to the defaults for the version installed on my machine (natch 😉 ). Take it easy and keep it sleazy folks! Yes, the potential for remapping a gamepad via Xpadder to work with non-gaming apps is endless. I am hoping to document and make available all of the control schemes I work with (and have created myself) on this blog. I have a few more in the pipeline, but I like to make sure that they are polished and not in need of further tweaking before I post. Also, I try to make sure that all my configurations are compatible with the default keybindings of the app/game as it just makes for easier implementation of Xpadder profiles which means lots of QC.